We stock the Britannia range of fabrics in our Conversationals palette with a British theme. 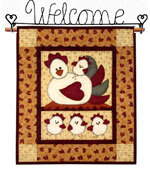 There is a panel and six fabrics by the metre, and they are also available as a fat quarter pack. Familiar British, and in particular London, icons are featured such as black cabs, post boxes, red buses and London landmarks on this range of novelty patchwork and quilting fabrics. The Nostalgia fabrics are smaller scale prints with designs that are reminscent of the 20's and 30's. We now have a strip roll with 30 fabrics cut to 2 1/2" strips. Presencia Perle no.8 cotton thread is now available. This excellent thread can be used for blanketstitch, running stitch for naive applique, stitcheries, hand embroidery and for tying quilts. 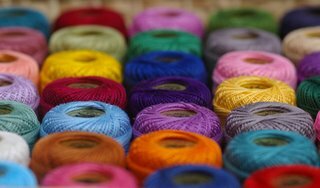 The 100% cotton thread is colourfast and the manufacturers - Presencia from Valencia in Spain, claim the thread is also resistant to fading from UV light. Perle Cotton has a distinctive twist which gives it a nice finish. The thread is easy to work with and very smooth through fabric. There are 50 plain colours and 20 variegated colours on 10g balls.